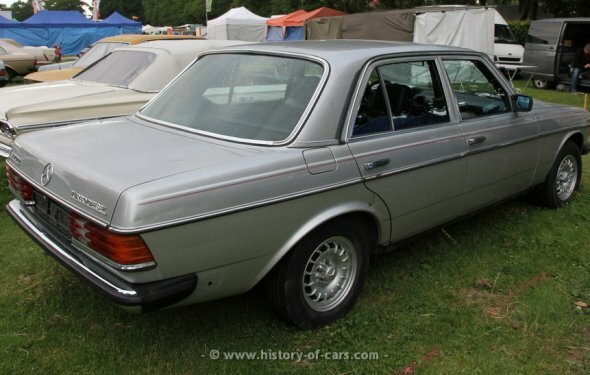 The Mercedes-Benz 300D was produced from 1975 through 1985. It was built atop the W123 platform and was originally powered by a 3-liter five-cylinder diesel engine that displaced 183.4 cubic-inches and produced nearly 80 horsepower. It was produced as a four-door sedan with seating for five and cost $12, 200 when first introduced. A turbo diesel option was introduced in late 1978 which offered 110 horsepower. By 1980 the horsepower increased to 120. When introduced, the cost to own the 300TD was $26, 270. The 1985 Mercedes-Benz 300 Series was powered by an overhead-cam five-cylinder, turbocharged engine offering 125 horsepower. It was available as a sedan, coupe, and station wagon. A revised four-speed automatic became standard along with a different torque converter that aided in solving a turbo lag and boost low-speed acceleration problem. Pricing began at $31, 500 for the 300D 4-door sedan and rose to $39, 500 for the 300SD 4-door sedan.